What better way to hype yourself up for the upcoming holiday than by setting up small reminders around the house? Today's St. Patrick's Day Idea featured on Mod Podge Rocks by Shannon from Madigan Made is a sweet and simple project that updates your everyday decor to incorporate a little more, well, green! She helps us set the festive mood by showing us how to make charming yarn decoupage vases. With a roll of shamrock-colored yarn, you can transform a simple glass jar into a cute centerpiece. And if you feel like making more than one of these simple crafts, they're great as hostess gifts and also work in a grouping as a set. For more information about this craft, you'll want to check out Mod Podge Rock's website. And if you're in the mood for creating other great crafts, click through our Craft Of The Day slideshow below. 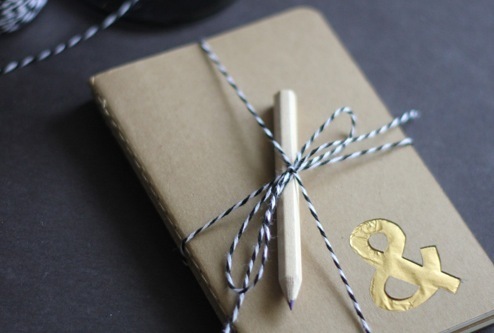 Add some personality to your Moleskine by carving original gilded designs and pressing them against the journal. Head over to <a href="http://www.designmom.com/2012/09/perfect-gift-gilded-moleskine-journal/" target="_blank">Design Mom</a> for the full tutorial.